Sony has recruited a new group of stars for their Men in Black spin-off. 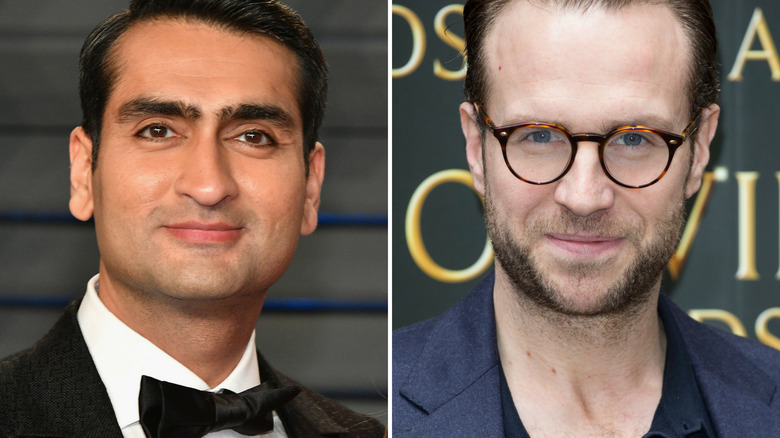 According to Variety, Kumail Nanjiani (The Big Sick), Rafe Spall (Jurassic World: Fallen Kingdom), and Les Twins (World of Dance) have joined the cast of the movie, which will star Thor: Ragnarok duo Chris Hemsworth and Tessa Thompson. Hemsworth and Thompson will reportedly play new Men in Black agents in the film, taking over for former franchise stars Will Smith and Tommy Lee Jones. Although specific details of the film's characters, including who Nanjiani, Spall, and Les Twins will play, are being kept under wraps, we do know that Liam Neeson will also star as the head of the Men in Black organization in London. Since the movie is reportedly "more of an ensemble piece than a two-hander," the supporting cast should have plenty to do. Nanjiani was nominated for an Oscar for his work co-writing the screenplay for The Big Sick, which he also starred in. The actor and stand-up comic is also known for The Meltdown With Jonah and Kumail, Life as We Know It, Central Intelligence, The Lego Ninjago Movie, Portlandia, Mike and Dave Need Wedding Dates, Burning Love, and Hot Tub Time Machine 2. Since 2014, he has starred on HBO's Silicon Valley. Spall recently played the bad guy in the box office smash Jurassic World: Fallen Kingdom. The actor is also known for Life of Pi, Hot Fuzz, The Ritual, Roadies, The BFG, Black Mirror, I Give It A Year, and Shaun of the Dead. He was nominated for a Screen Actors Guild Award for Outstanding Performance by a Cast in a Motion Picture for 2015's The Big Short, which was also nominated for the Oscar for Best Picture. Les Twins are actually Laurent Nicolas Bourgeois and Larry Nicolas Bourgeois, a dancing duo who have led the Michael Jackson: The Immortal World Tour for Cirque du Soleil, toured with Beyonce for The Mrs. Carter Show World Tour and the On The Run Tour, and won the first season of the NBC dance competition series World of Dance. The pair's previous acting experience includes the music drama Breaking Through. The new Men in Black movie has already started shooting in London under director F. Gary Gray (The Fate of the Furious), who is working off a script from Art Marcum and Matt Holloway (Iron Man). The original movies' Walter F. Parkes and Laurie MacDonald will produce, while Steven Spielberg will executive produce. The film has a June 14, 2019 release date.